James Leonard Brierley Smith was born in Graaff-Reinet on 26 Sep 1897. He studied Chemistry at the universities of Stellenbosch (MSc) and Cambridge (PhD). On his return from Cambridge he joined Rhodes University to teach Chemistry. Gradually, however, he switched over to Ichthyology, a field in which he later became world famous in connection with the coelacanth, the 'fossil' fish. On the 22nd of December 1938, Hendrik Goosen, captain of the trawler 'Nerine', caught a strange fish. Marjorie Courteney-Latimer from the East-London Museum, who was setting up the museum and often went to look at his catch for anything interesting, was very excited when she spotted this "most beautiful fish she had ever seen". She made a rough sketch and sent it to Prof. J.L.B. Smith who identified the fish as a coelacanth and named it Latimeria chalumna in honour of Marjorie Courteney-Latimer and the Chalumna river where it was caught. Marjorie Courteney-Latimer died on 17 May 2004, at the age of 97. 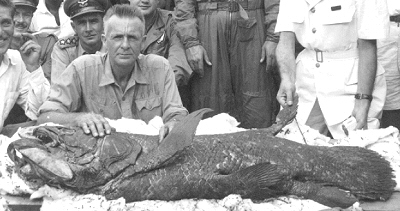 When, in 1952, another coelacanth was found at the Comoro Islands, J L B Smith obtained permission by the South African Prime Minister, D F Malan, to use a Dakota airplane of the air force to pick up this precious fish and bring it to South-Africa. By now hundreds of these cave dwelling archaic fishes have been found. 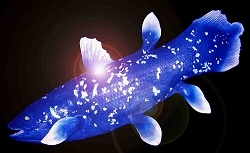 They live in depths of 150 - 400m. J.L.B. Smith died on 8 Jan 1968. After her husband's death, Mary Smith founded the Institute of Ichthyology in Grahamstown and headed the institute until her retirement in 1982.